Across the distances, online conversation overcomes the limitations of space, time, the local and the remote. This is the aspiration of the Art of the Networked Practice Online Symposium: how to bring people together in creative dialogue via the network driven by purpose, activated by play, and informed by issues that percolate up from the need to understand and grasp the networked culture we immerse ourselves in each and every day. This coming March 29-31, 2018, we will again stage the Art of the Networked Practice Online Symposium, a reprise of the first iteration from 2015. This time, the Symposium focus is on the theme of “social broadcasting,” traveling from Singapore to Chicago for three days: March 29 – Nanyang Technological University/School of Art, Design & Media (Singapore); March 30 – LASALLE College of the Arts (Singapore); March 31- the School of the Art Institute of Chicago, Department of Performance (US). 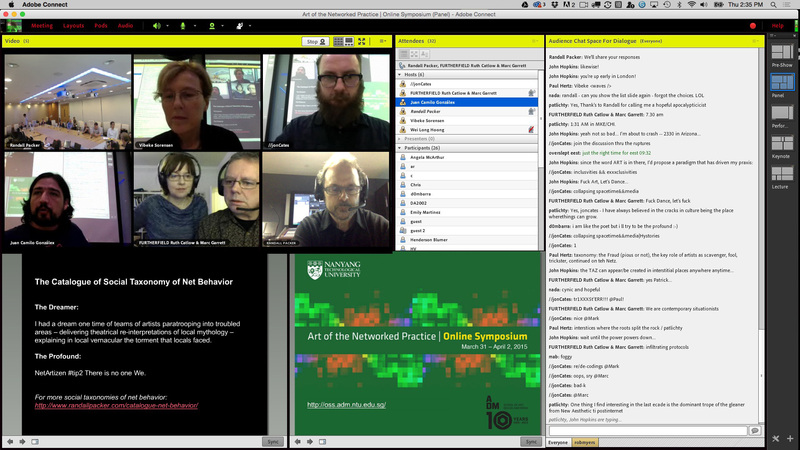 In the screenshot above from our Webconferencing platform Adobe Connect, taken during the 2015 Symposium, the participatory “actors” that made up the third space conversation were situated in a multiplicity of spaces: the physical conference center in Singapore (local), remote panelists in the UK, and the online chat, where cross-dialogue and multi-threaded banter shifted and collided back and forth from more than 40 countries around the world. Our third space networked dialogic environment is conceived as an open space, a broadcast space, an active space, where a free-form social etiquette encourages anything is possible, where the unexpected is expected. In the session captured above, we were discussing the “Catalogue of Social Taxonomy of Net Behavior,” a challenging discourse on memes and networked tactics catalogued from Furtherfield’s (UK) NetBehaviour e-mail listserv. The conversation was incubated prior to the Symposium in NetBehaviour, itself an open space of critical dialogue and wordplay, or what Furtherfield co-directors Marc Garrett and Ruth Catlow refer synergistically as DIWO (Do it With Others). Indeed, the concept of DIWO, a more collaborative interpretation of DIY, is the underlying force of our socially networked third space dialogue. As an alternative to the asynchronous communications culture of texting and social media and e-mail, for a few golden hours, we revel in the live experience of real-time global conversation. For the 2018 Art of the Networked Practice Online Symposium, we intend to push our third space conversation even further. This time around we have an illustrious and highly qualified team of online moderators from around the world, including: Singapore, Sao Paolo/Brazil, Paris/FR, Baltimore/MD, Brighton/UK, Providence/RI, and Dubai/UAE, all of whom will instigate and help drive the discourse surrounding the keynotes, live networked performances, and global roundtable discussions planned for the three-day Symposium. Over the coming months leading up to the Symposium we will explore the possibilities. I foresee many new ideas and approaches emanating from our group of scholars, graduate students, and artists who are exploring and pushing the boundaries of new media discourse. Based on topics that include: “being and connectedness in telematic space,” or “networking the real and the virtual,” or “intimate glitches across internet errors,” I foresee a hyper-dialogue, in which conversation is embedded and extended by links, references, and improvisatory wordplay: or as Vannevar Bush described some 60 years ago, a “trail of associations” that move non-linearily through the collective imagination. So in fact, our globally broadcasted third space dialogue spirited by DIWO and a desire to socially engage the issues of our “networked practice, is just such an opportunity: let us think and create and interact with one another in the far flung dialogic possibilities of the social broadcast.